Truly one of the automotive industry’s pioneers, it was in 1889 that French bicycle maker Peugeot built its first horseless carriages. The initial offerings were steam-powered three-wheelers. Peugeot holds a place in automotive history for being the first company to sell an automobile to an individual. By 1907 the company was well established as a leader of automobiles in the four-wheeled, gasoline format. 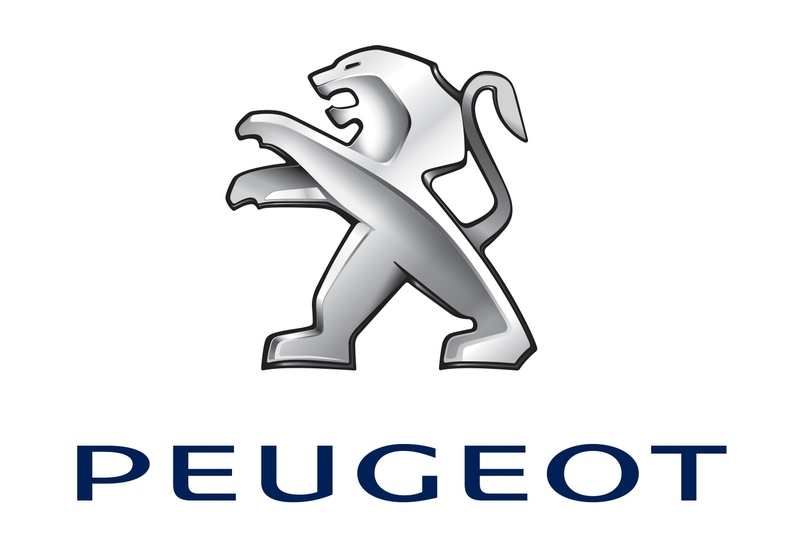 That was also the first year that the famed lion appeared on Peugeot products. In the early days, carmakers earned their reputations on the race circuit. Management at Peugeot were relentless in seeking publicity for their product. Europe wasn’t big enough for the cocky company as it endeavoured to showcase its fleet automobiles. A Peugeot took the checkered flag at the Indianapolis 500 in 1913, 1916 and 1919. Those wins didn’t hurt sales one bit on either side of the Atlantic. The company survived the Dirty Thirties by offering products with avant-garde aerodynamic styling. It even went so far as to field a car with an electrically retractable top. 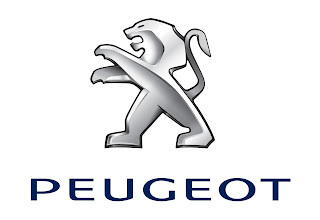 During World War Two, the Peugeot factories were seized by the Nazis. Trucks and vans were built for the Third Reich. Arial bombing of the plants by the Allies was frequent and damage was heavy. After France was freed from the Nazis in 1945, Peugeot was able to return to civilian manufacture of passenger cars in 1948. 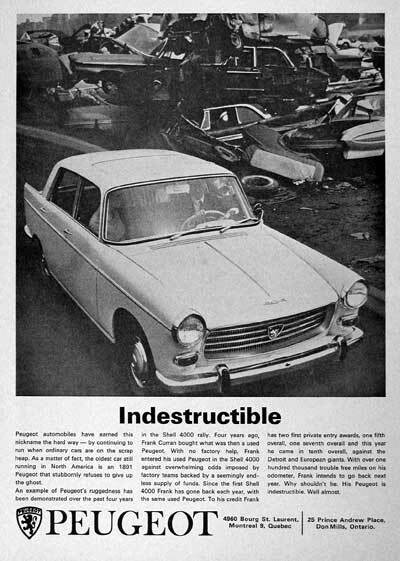 It appears that Peugeot began to export cars into Canada around 1960. Canada Track & Traffic lists the prices for Peugeot that year. The economical 403 family, comprised of the four-door sedan, the sliding roof sedan, the convertible, the six- and eight-passenger station wagon, were in the same price range as the compact Rambler, Chevrolet Corvair and the Studebaker Lark 6. The French cars did not sell in large enough numbers to warrant a domestic breakout in 1960 and Peugeot’s sales are lumped in with the 7,476 "Other Imports" listed in Canadian Automotive Trade magazine’s 1960 annual total. A year later. a Peugeot owned by a private citizen ran the gruelling Canadawide Shell 4000-mile Rally from Montreal to Vancouver in seven days. Sales had grown sufficiently that Peugeot now rated its own column in Canadian Automotive Trade. The periodical reported sales of 1,628 units. That tally is followed by 954 units in 1962; 581 units in 1963 and delivery of 707 units in 1964. The low figures reflected stiff new tariffs imposed by Ottawa on foreign automakers as the Diefenbaker government took steps to protect the domestic automobile industry. Fierce rivals on home turf, Renault and Peugeot joined forces in Canada. In 1965 the two automakers began to assemble cars for the Canadian market in St. Bruno, Quebec. Now considered domestic players, sales were no longer hampered by import taxes. Renault and Peugeot were incorporated under the auspices of a provincial crown corporation using the acronym SOMA (Societe Montage Automobile). Sales offices for Peugeot were located in Ville-St-Laurent, Quebec and in Don Mills, Ontario. Having a domestic presence helped Peugeot to more than double its sales Canadawide as units delivered reached 1,405 in 1965 and rose again to 1,655 units in 1966. A very sleek and slippery 504 bowed for the 1967 season. This was a large car, at least by European standards. The vehicle rode on a 2 743 millimetre (108-inch) wheelbase, putting it squarly in the North American industry’s compact category. The look of the Puegeot was one of a prestigious vehicle. Dedicated consumers had come to expect a high quality of fit and finish; that was certainly part of the Peugeot tradition. 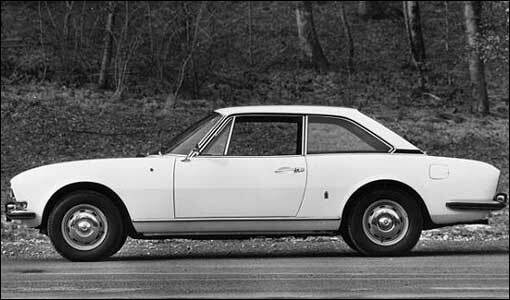 The 1967 Peugeot 504 boasted sleek lines. The newest Peugeot incarnation promised to be more powerful, more spacious and even more comfortable than its predecessor. It did not disappoint. 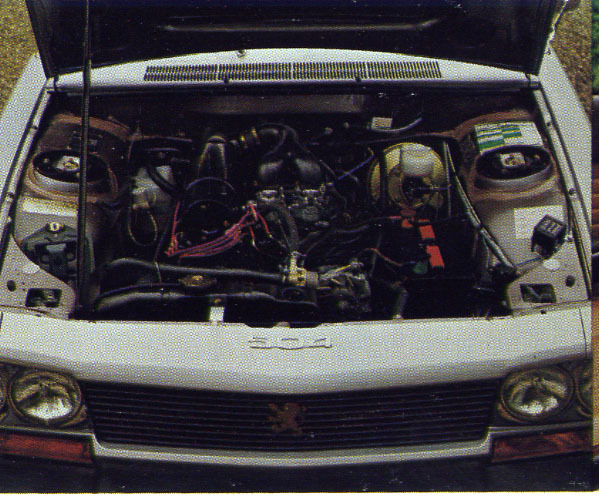 The 504 boasted an elegantly lined body built with monocoque construction. The sensuous Peugeot featured fully independent suspension, anti-roll bars front and rear, a suspended hypoid real axle, trailing arms and four-wheel disc brakes. The new styling prompted Canadians to pull into Peugeot dealers' showrooms and sign on the dotted line, Dramatic looks no doubt contributed to the modest rise in sales that reached 1,810 units for 1967; an even better finish of 1,947 units in 1968 and up to 2,022 units delivered in 1969. Calendar year sales for 1970 reached 2,270 units. In 1971 the final figure of 2,254 units made Peugeot number 56 in domestic sales—sandwiched between AMC’s Matador and AMC’s Gremlin. Peugeot's sales were off ever so slightly to 2,196 units in 1972. Sedan listed for $6,795 in 1976. The 1976 Peugeot station wagon weighed in at 1 446 kilos (3,190 pounds) for the gasoline model and 1 456 kilos (3,210 pounds) for the diesel version. a cruising speed of 136 kilomtres (85 miles) per hour. The SOMA factory closed its doors in January of 1973 and Peugeot sales dropped to 1,029 units delivered. Sales would inch upward to 1,189 units a year later and though it was only Number 70 in the nameplate sales, Peugeot rose to 1,630 units in calendar year 1975. The Peugeot gasoline engine for 1976 measured two litres (120 cubic inches) in displacement and generated 92 horsepower. The Diesel mill had a 2.2-litre (128.8-cubic inch) displacement and rated 72 horsepower. Seats lay flat in the 1976 Peugeot. Peugeot engineers promised consumers that the 504 had luxurious comfort, deluxe functionalism, durability and security built into it. The cabin boasted a most spacious interior; wall-to-wall carpeting; fully reclining bucket seats; contoured rear seats with a retractable centre armrest, a standard sunroof and tinted glass. Safety features included front and rear anti-sway bars; low centre of gravity, rack and pinion steering; disc brakes on all four wheels; Michelin XAS radial tires and four-wheel independent suspension. Durability was derived from monocoque construction; stainless steel trim; primer coat and rust proofing designed to meet Canada’s extreme climatic conditions and engine stamina proven in races and rallies. 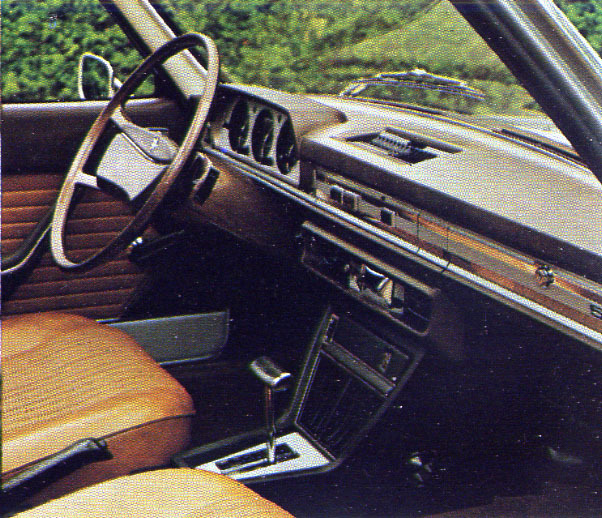 Instrument panel of the 1976 Peugeot was extremely functional. 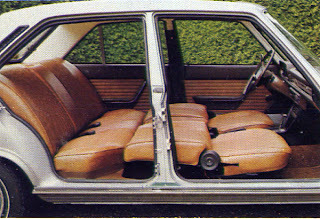 For 1976 selling season Peugeot dealers offered the 504 GL Sedan for $6,795. For an extra $430 one could order the automatic transmission. The fancier 504 SL Sedan listed for $7,685 with the manual shift and for that extra $430 the automatic transmission became part of the deal. The 504 Diesel Sedan listed for $8,370 and the Diesel-powered wagon carried a price tag of $8,880. 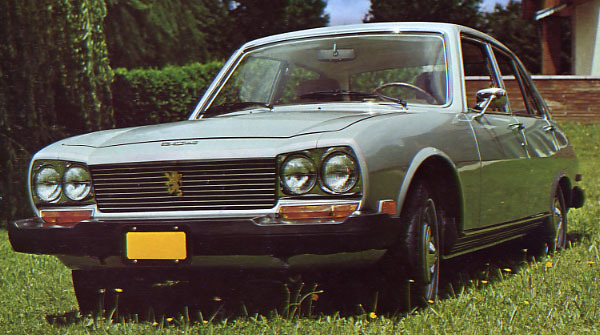 Peugeot would finish the calendar 1976 year with sales of 1,225 units.